Simply supporting mobility is no longer enough. While organizations in most industries must incorporate mobile devices and applications into their operations to stay competitive, basic mobility deployments are not sufficient to create a competitive edge. Giving users access to email, calendar and a handful of productivity apps on their mobile devices was once a differentiator, but organizations are increasingly shifting toward true “business mobility,” a model characterized by moving core business processes to mobile apps and devices. To support this next level of mobility, technology developers have begun offering end-user computing suites. 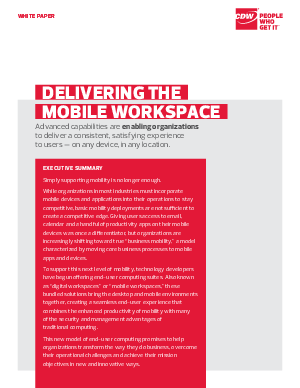 Also known as “digital workspaces” or “mobile workspaces,” these bundled solutions bring the desktop and mobile environments together, creating a seamless end-user experience that combines the enhanced productivity of mobility with many of the security and management advantages of traditional computing.